Bryan Dobbins is an old friend and he has owned The Woodsman Company in Fort Smith, Arkansas, for thirty years. It is the best outdoor store in the state and if you are in the area you should definitely check it out. Bryan and Bo have fished together quite a bit over the years from our Arkansas streams and rivers to Montana and south Texas for Redfish. This week in celebration of Bryan’s birthday he wanted to chase some Little Red River yellow bellies with the streamer rod. This was not the ideal streamer day as the there was only one unit generating and it was a blue bird day. Nevertheless the streamer rods, sink tip fly lines and small streamers were rigged and the hunt was on! 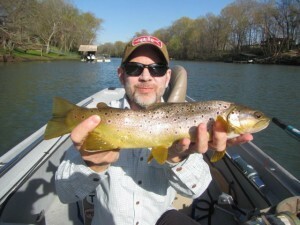 Obviously Bryan is a very experienced, top notch, fly caster which makes all the difference in this type of fly fishing. The streamer has to be delivered to the target accurately and the angler has to find just the right stripping technique in order to entice a big Brown Trout to strike. Oh yeah, it doesn’t hurt to have one of Bo’s best streamer patterns! 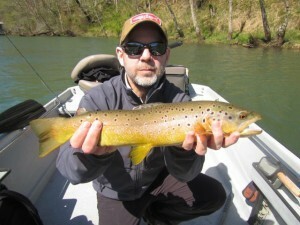 Bryan caught the above slot limit yellow bellies along with a number of other nice Brown Trout. He also took a number of fat Rainbows on streamers as well as several others on a nymph rig as the water was turned off during the afternoon session. The guys also did a little planning of a fall trip to Montana to check out the Clark Fork and Blackfoot Rivers along with a couple of other streams to be determined. Pretty sure that Bryan had a good birthday fly fishing streamer trip!